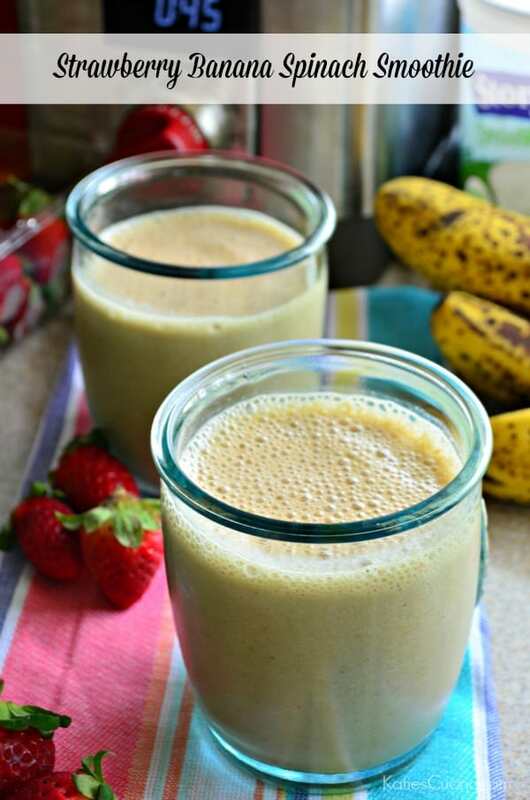 I’m starting the week off with a Strawberry Banana Spinach Smoothie. 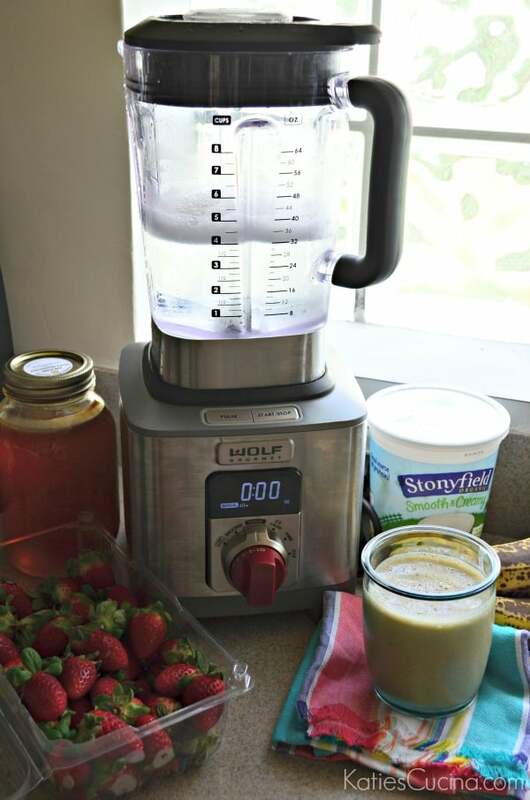 I’ve been making this smoothie almost daily since receiving a Wolf Gourmet High Performance Blender last month! It felt like Christmas came early when my husband and I opened up our new high performance blender. We have dreamed of owning one for years and our dreams finally came true. And my husband, Jon, told me that I’ve officially made it in the blog world because this is all he has wanted for years! So now that I’ve made it in my husbands eyes let’s talk about this semi-green smoothie. The first day I turned on the blender my toddler looked at it in awe. And I told him we were gonna make a smoothie. And every day after he would wake up in the morning, run into the kitchen, point at the blender and scream “smooth”. He quickly became addicted to drinking smoothies. He drinks any where from 3-6 ounces. I’ll take it. So that’s when I started throwing spinach in our smoothies. I figured if he would drink just a little of it I wanted to try to sneak in some greens! And he didn’t notice a difference. Win win for this mama. 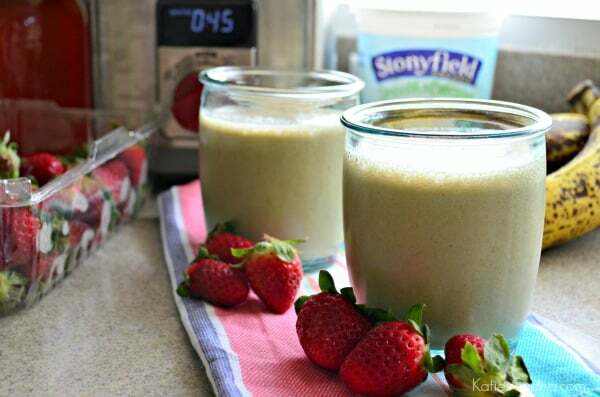 You want to layer the smoothie with the soft items first like liquid or yogurt, spinach, strawberries, banana and then place the harder frozen items on top. This is what I read in the instruction booklet and this is what I’m sticking with. I love the 4 program settings (smoothie, ice crush, puree, and soup) and the LCD control panel. Click to smoothie and press start–it’s that easy. Then it begins to count down so you know how much longer you have of blending. My new Wolf Gourmet High Performance Blender also fits on the counter top and under our standard-size cabinets. So I can keep it on the counter for easy access. I honestly have used it daily since receiving it in early December! You can’t tell in the photos but there is also an emulsion cup on the lid to add ingredients slowly into the blender jar. I love that feature especially when making salad dressing! The blender retails for $599 and can be found at Sur La Table, Bloomingdales and Frontgate. Clean up is a breeze. I rinse it out with hot water then fill the jar with 4 cups of hot water and a pump of dish soap. Place the jar back on the base, select manual and click start. Start slowly and then intensify the speed setting up to 10 and run for 30 seconds. The blender cleans itself! Once the 30 seconds are done lower the speed and turn off. Rinse out and set it on a towel on the counter to dry. They also give you instructions if you need to do a deep cleaning to get any food stains off the jar. I haven’t had to do that yet. If your in the market for a new blender I highly suggest the new Wolf Gourmet High Performance Blender. I honestly can’t think of one bad thing to say about it. Ok, maybe the stainless steel. I’ve come to realize that I hate cleaning stainless steel. So there you have it. That’s my absolute only complaint about the blender. 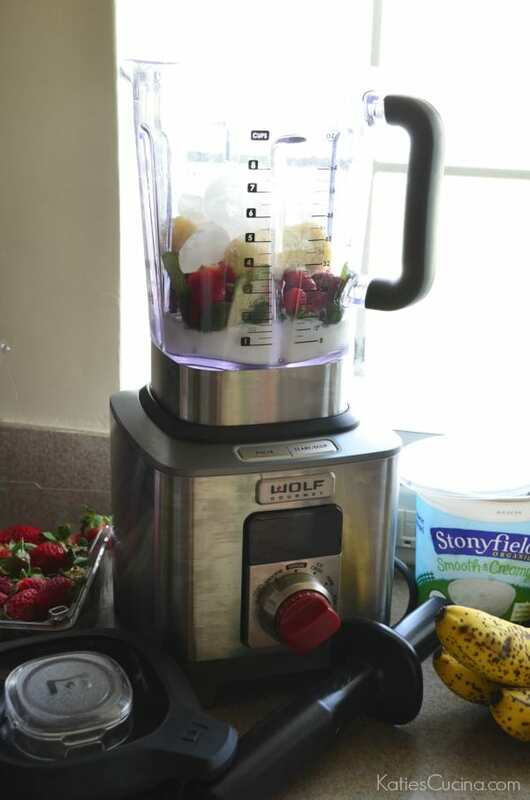 The performance is amazing and I’m so glad my friends at Wolf Gourmet gave me the opportunity to review the blender. If there is one must have counter-top appliances I would definitely say it’s a High Performance Blender! Stop by later in the week to enter for a chance to win one of your very own Wolf Gourmet High Performance Blenders! And keep an eye out for at least one new smoothie recipe each month! Layer in the order of the ingredients listed above. Blend on smoothie setting for 45 seconds. Divide evenly among glasses and enjoy immediately! 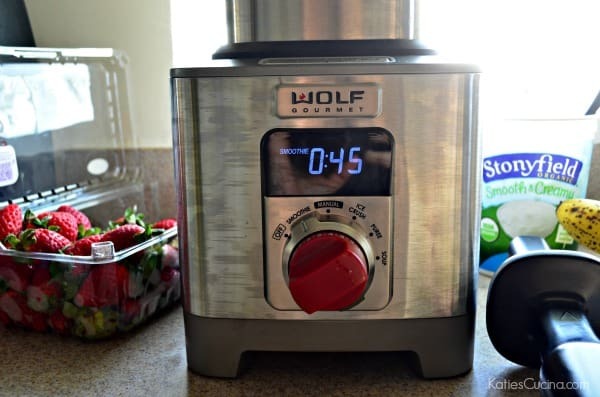 Disclaimer: Wolf Gourmet sent me a Wolf Gourmet High Performance Blender for free to review and enjoy. I have a year partnership with Stonyfield Organics–this post was not sponsored by them, I just love the yogurt! As always all opinions are my own.